Showing What it's Made of! I had a great day of fishing yesterday in my new hometown with a couple of fly fishermen in the area. We live in an interesting place in Eastern Kentucky where the trout fishing is downright amazing, but I can count the number of active fly fishermen on one hand (literally, I made number 5 when I picked up the fly rod). I met up with a couple guys yesterday who have been western fly fishing for as long as a year or less. When I pulled the Tenkarabum Traveler 44 out of the back of my truck and secured some level line to the lillian, let's just say they were intrigued. Then, after we trekked through the brush to the water and that collapsed rod (which was must easier to maneuver through the woods) suddenly became over 14ft long, they were interested. I'm new to fly fishing in general and to tenkara in particular. Nymphing with a hare's ear, I knew I was missing some bites and got shut-out at our first spot. They didn't have much luck either. 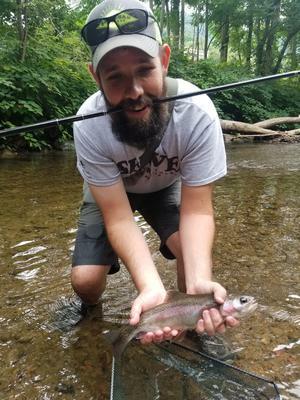 At our second spot up the creek, I hooked up with a fiesty little bream, and was consistently detecting bites from 2 inch creek chubs. As the guys creeped upstream, I connected with a rainbow in this little deep channel. It was about 12 inches long and man was it exciting landing that in the net! Unfortunately, the guys who were so interested in seeing the rod in action were well out of range. We ended the morning at a third location under an abandoned railroad bridge. We took turns tossing nymphs under this bridge into a deep hole that we absolutely knew was holding fish. We each hooked up with some nice specimen. I had one large 'bow break off my tippet, but then I set the hook on a 14 1/2 inch wild trout! I have never heard a rod sing like the tip of that Traveler! I fought hard for several minutes. As the rod practically doubled over the guys hooped and hollered. They may not be converted yet, but they are certainly convinced; that tenkara rod showed what it's made of! Also, a huge thanks to Chris for this site, amazing & prompt service, and the one-on-one recommendation. I bought the Tenkarabum Traveler 44 at your advice and it is the perfect fit. Comments for Showing What it's Made of! Mitch - Great report! You have to love the ability of Chris to analyze your fishing situation and recommend an awesome rod to get you started on your journey. My second rod was the TenkaraBum Traveler 44. My first rod was the Suntech Keiryu Sawanobori 63. I described where I was going to fish, and the kind of fish I was after, and the Sawanobori was Chris' recommendation. I was wondering if my passion and love for the Sawanobori was due to it being my first premium rod. I had not fished it for awhile. I fished it again earlier this week, and yes it is an amazing rod. I now have many rods. I only have one convert to Tenkara so far. The TenkaraBum Traveler 44 is one of my favorite rods. With its 3 lengths you get an amazing versatility. One of the best things I did was last year I purposely fished my TB Traveler 44 at only one length for several sessions to get to know it as a 360 rod, 400 rod, and 440 rod. If you do that, you end up knowing the rod at all lengths and you don't end up with a "favorite" length. So you will fish it at the best length for the situation. You also get to know your rod as a 360, 400, and 440. It truly is 3 rods in one. Nice trip! Where in KY are you fishing, Red River Gorge? I’m down near Paintsville, and we have a stocked tailwater and a state trophy stream just below it.